The unexpected is bound to happen - sudden repairs, flat tires and even regular maintenance. It all adds up and it can be quite expensive. 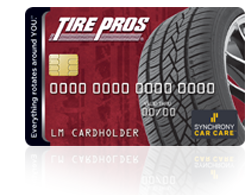 Thats why your locally-owned The Pit Stop Tire Pros now offers fast and simple financing with the new Tire Pros® Preferred Customer Credit Card. Get the card for your car today because YOU DESERVE special financing. As the true tire and automotive professionals, The Pit Stop Tire Pros aims to make your experience simple, straightforward, and hassle-free. it's the kind of trusted service and experience that only a neighbor can provide.